. Published on February 1, 2019. We are pleased to reintroduce you to Dr. Jason Neiffer, NCCE’s Tech-Savvy Administrator! Jason has worked with NCCE since 2013 to provide social media support, school- and district-based trainings, and engaging (and sometimes ranty 🙂 ) conference presentations at NCCE. We caught up with Jason recently in his offices at the University of Montana in Missoula, Montana! Location: Missoula, Montana, though I love to travel and working from ANYWHERE with a laptop! Current jobs and your role with NCCE: By day, I am the Assistant Director/Curriculum Director of the Montana Digital Academy, Montana’s state virtual school. By night, I am NCCE’s Tech-Savvy Administrator-in-Residence. Previously, I spent 13 years in high school social studies, debate, speech, newspaper, and computer science classrooms. I also co-host the EdTech Situation Room podcast with Dr. Wes Fryer. Current computer: I like computers [Editor’s Note: Really?? ], so, I regularly trade out so I can keep up on the current Windows, Mac, and ChromeOS offerings. I am currently carrying a personal Chromebook Pixel, and I love it! I have a six-year-old trusty iMac on my desk at work, as well as a first-generation Surface Book in my work bag. Current mobile device(s): I carry an LG V20 Android phone, updated to Android “Oreo.” It is a few years old, but, it is one of the last “flagship” phones that has a user-replaceable battery. When I travel, I put on a mega-sized battery on to make it through a full day of travel, training, conferences, or trips. One word that best describes how you teach or work: Relentlessly! 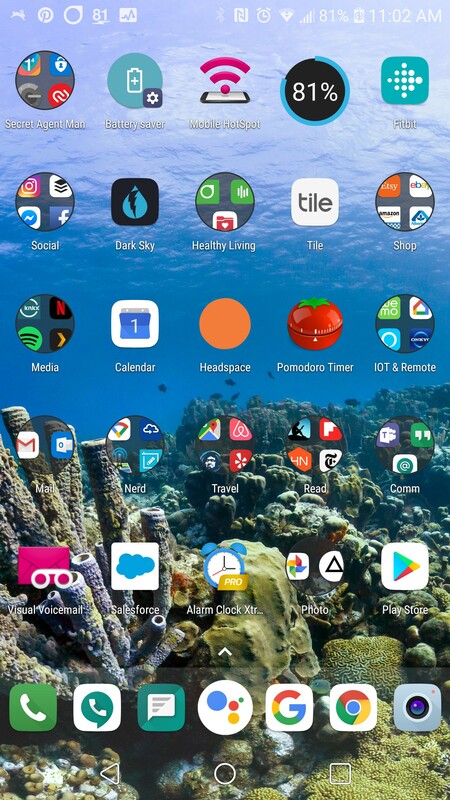 Show us a screenshot of your mobile device’s home screen. Sure. It is organized… kinda. What apps/software/tools can you not live without? Google Suite has treated me well since my organization adopted the platform in 2010. With the release of Google Drive in 2012, I now have all my work and personal files available to me on all my devices, auto-saved and backed up to the cloud. 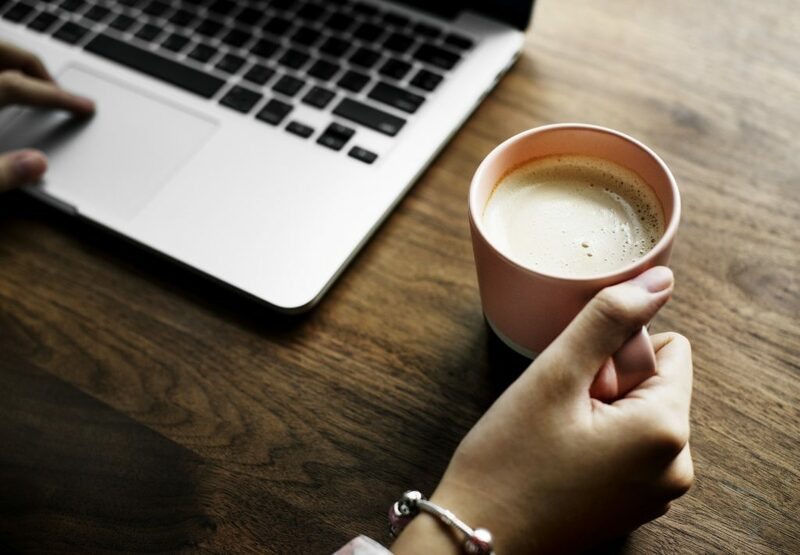 I often have multiple projects on my plate, I like being able to log into my cloud-based documents anywhere, anytime, and make forward progress that shows up on the next device I use. Despite being told by other doctoral students on other campuses that using Google Docs for my doctoral dissertation was “insanity,” I used that platform to write my entire dissertation, from early drafts to the final copy. I also moved to Google Slides for ALL presentations in 2016, and I LOVE it! I give 20-30 presentations a year, and I am a student of Presentation Zen. Google Slides makes professional, clean slides. I also work with a few organizations that use Office 365, and I think the cloud-based enhancements to the traditional Office platform make it a much more powerful tool. Other than your phone and computer, what gadget can you not live without? My notebook! I carry a portfolio with a pocket notebook everywhere! I love Field Notes, Field Books, and Moleskin notebooks. I have learned over the years that my memory and understanding improves dramatically when I write things down! What is your favorite organizational tip, app or advice? I LOVE Text Expansion. With the amount of email traffic that crosses my various email accounts, I couldn’t do my job without it! What browser do you use regularly? I primarily use Chrome; however, I keep both Firefox and Edge at my fingertips as some sites work better in one browser or another. I have been impressed by Firefox and Edge, both are speedy and stable. I have installed Firefox on my Chromebook Pixel, and I’ll admit, I like having it handy! What is your preferred social media channel for connecting with others? I like Twitter for its ability to keep me connected to hundreds of other teachers around the world. However, I have made some rules about my engagement. I limit my Twitter usage to 15 minutes or less a day. I also have had mixed experience with Twitter chats. While I LOVE Twitter chats as a means of connecting and supporting fellow educators, more controversial topics are best left to other forums. It is difficult to create to have a professional, respectful disagreement in 280 characters or less. I am a student of David Allen of “Getting Things Done” fame. Based on his work and a little of my personal experimentation over the past 25 years, here are my best tricks for getting things done. Two Minute Rule: If you can get it done in two minutes, just do it now. Don’t put it off. Write Down Lists: I am a list maker, ranging from to-do lists to technical checklists. I LOVE the feeling of crossing something off a list! What are your most valuable classroom/work routines? Get. Up. Early. I was a night owl during college and my first ten years of teaching, but, I eventually figured out that IF I can get to bed early and get a full night of sleep, waking up before the rest of the world has some so many advantages! I love waking up early, heading to the coffee shop of my choice, and then tackling my projects before the rest of the world has the opportunity to email questions or requests. When you are not living the glamorous work life, what do you like to do in your spare time for fun? My wife, Alison, and I love to travel! I have been completed hooked on traveling internationally since Alison, then my world-traveling girlfriend, asked me to backpack around Europe with her during a college year abroad in 2000. Since we have been regularly lost together around Europe and Central America. We look forward to tackling South America and Asia next! What app or web service, not currently in existence, do you wish someone would develop? I want the people that created Zombo.com, the most useful website ever, to redesign the site without Flash to keep it relevant for the next 20 years. As a tech-savvy teacher, what everyday thing do you feel you excel with/at versus other teachers/administrators/mentors? What is the best teaching advice you have received? I have been lucky to work with so many great teachers during my teaching career. Here’s a couple of bits of wisdom. First, the best history teacher I know told me early in my career that the best class he took in college to prepare for teaching adolescents was improvisational acting… that’s right, improv! He teaches a variety of very rigorous AP courses and had monster success rates. Yes, it is partly about excellent pedagogy and feedback to students, but, it is also creating an environment where students feel engaged and noticed. Creating a fun, responsive environment is so much a part of that. I now believe that good teaching is made up of good pedagogy… GREAT teaching is good pedagogy mixed with a bit of performance art. Second, the best English teacher I know told me early in my career that knowing my content pays off in the classroom. As a history teacher, it meant loving my subject area so much that I was willing to read books in the summertime, travel to distant lands to learn more about the places I taught about in the classroom, and dig deeply into individual subjects to understand the nuances of content. That paid off for me over and over in my 13 years in the classroom. I just started Make Just One Change: Teach Students to Ask Their Own Questions. So far, so good. I have read some materials in the past that had this same basic premise that, in my mind, ignored what we know about scaffolding and pedagogy, but, I like where this is going. My primary area of expertise in the history classroom was European History, so, I always have a few European-focused books scattered around bedside tables and near the top of my Kindle list. Right now, I’m reading this Leon Trotsky biography, this history of the Czech lands in eastern Europe, and this history of sausage (yes, sausage). Are you comfortable ending this interview on the topic of sausage?